Business Stationery in Cirencester : Busy Fingers 01285 656757 Printers in Cirencester. Our Business Stationery Full Colour Printing is carried out on our modern Konica c6000 Roland 700 and KBA B1 Printing Presses. The exceptional quality of these machines allows us to produce printed work of the very highest standard, ensuring that whatever your message it is powerfully delivered. The majority of our printing is now produced using stochastic screening, which virtually eliminates conventional printing dots and produces considerably enhanced results. In addition to the standard stocks we also offer the option of pricing Full Colour Printing on a wide variety of non standard stocks. 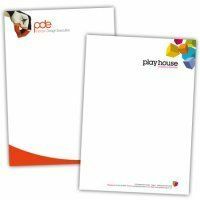 Our Letterheads are printed on 100gm Executive paper. This has been specifically designed to perform through laser and inkjet printers. Our Full Colour Business Stationery Executive Compliment Slips are printed on 100gm white cartridge paper. This paper has been specifically designed to perform through laser and inkjet printers. Our Full Colour Business Stationery Headed Paper and Compliment Slips are printed out on our modern Konica c6000, Roland 700 and KBA B1 Printing Presses. The exceptional quality of these machines allows us to produce printed work of the very highest standard, ensuring that whatever your message it is powerfully delivered. The majority of our printing is now produced using stochastic screening, which virtually eliminates conventional printing dots and produces considerably enhanced results. In addition to the standard stocks we also offer the option of Business Stationery Headed Paper and Compliment Slips on a wide variety of non standard stocks. Please note: Paper and Card for Colour Printing is always white. 'Coloured Paper' is achieved by printing the required background colour as part of the Full Colour Print Process. For Business Stationery, Headed Paper and Compliment Slips, please call Busy Fingers in Cirencester. An NCR Sets consists of at least two sheets. They rely on pressure to transfer an image from the top sheet to those underneath. They can be used with a ball point pen or using an impact printer such as a Dot Matrix or Daisy Wheel. The amount of pressure required to form an adequate copy on the bottom sheet increases with the number of sheets in the NCR sets. For this reason sets should not normally be more than five sheets. Business Stationery NCR Sets Sheets are available in the following colours: Blue, Pink, Green, Yellow and White. A 170gm white card bottom sheet can be specified if required. This is particularly useful in applications where loose sets are needed but flat surfaces for writing are difficult to find! NCR sets are supplied ready to use as loose individual sets as standard. Please Note: Our Business Stationery NCR Sets do not work with Ink Jet or Laser Printers. For Business Stationery, Headed Paper and Compliment Slips, please call Busy Fingers in Cirencester 01285 656757 to speak to a friendly and professional member of our team and we will be more than pleased to discuss your printing needs. So whether you're looking for professionally printing of Business Stationery, Wedding Invitations NCR sets or Leaflets for your company, please call us on 01285 656757 to speak to a friendly and professional member of our team and we will be more than pleased to discuss your printing needs. You can also email us at info@busyfingersprinting.com and we will endeavour to respond to your query as soon as possible. We look forward to hearing from you in the near future. Looking for a printers or printing in : Cirencester, Swindon, Cheltenham, Gloucester, Stroud, Chippenham, Wootton Bassett. Then please call. 01285 656757.